Croplands Equipment has been manufacturing spray equipment since 1972. Vine Tech Equipment works closely with Croplands to custom build your sprayer to your specific needs, ensuring your crops receive the best coverage! In conjunction with SARDI, Croplands has developed a 5-Blade fan assembly for the Quantum Mist™. Axial type fan head, hydraulically driven, fully integrated, light weight, impact resistant, roto-molded cowl. Fully enclosed sealed bearings. New features such as the recessed nozzles that can hold up to 16 nozzles per head. With integrated fan guards that have totally liquid supply tubing and new air flow designs. The Vine Tech Quantum Mist™ Orchard Tower provides supurior coverage with low volumes and higher ground speeds. Options include Hydraulic Wind Compensation. Increases flow to left or right side with the flip of a switch inside the cab. As orchard growers and contractors would know, with increased costs of production factors such as fuel, labour and product rates play an important role in choosing a new sprayer, as well as effective coverage when applying fungicides and foliar fertilisers. 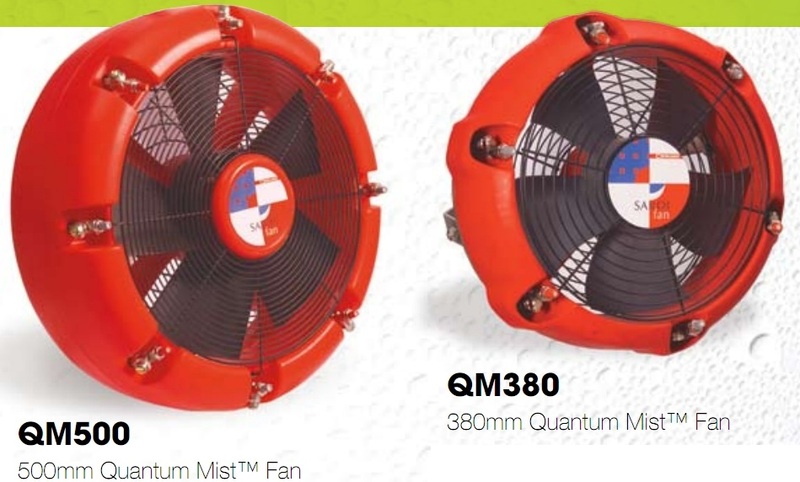 The Quantum Mist has a number of axial fans, which are designed to move air in a corkscrew pattern to get through the canopy and on to underside of leaves. With three Quantum Mist heads per side, the Tower Sprayer provides much more precise application to each sector of the tree, with a total of 24 nozzles per tree-canopy side compared to a conventional sprayer with around 10 nozzles per side. This delivers a better coverage compared to traditional blast fans. There is also the potential to lower fungicide or foliar fertiliser application rates due to better coverage. The Quantum Mist™ system lends itself perfectly to be retro-fitted to most grape harvester machines. The hydraulic drive system of most harvester/tractor units is the idea platform to drive the Quantum Mist™ heads. With the ability of up to six rows being sprayed at one time, the Quantum Mist™ sprayer maximizes spray coverage and efficiency. Hydraulic Control Block for oil distribution, anti-cavitations, relief system, test ports, soft-start system, and full air adjustment for increasing or decreasing air-speed. Hydraulically driving Quantum Mist™ heads four per row, fitted with 5-blade SARDI fans for high volume, turbulent unrestricted air-flow and up to 16 nozzles per head. Tandem axle assembly for superior ride. Self-steer drawbar to accommodate all terrain and headland needs. Croplands offers a full range of liquid control options for the operator, including the TrimbleAuto Rate controller with gal per acre or gal per 1000 feet display and data-logging capability. Large capacity 160 I/min /42 gpm Diaphragm pump for maximum bypass agitation and to accommodate a wide range of application rates. We are stocked with certified Croplands parts for all the above machines. If you need any repairs on your Croplands sprayer, or just need a routine service check, call or simply bring in your equipment to schedule service. PURCHASE YOUR NEXT CROPLAND SPRAYER FROM US! As a certified dealer for Croplands we are equipped with the knowledge and information you need when considering purchasing a new piece of equipment! Give us a call to discuss how we can help customize your sprayer for your specific needs.